VICTORIA—The first word that jumps to mind when you see Gabrielle Senft on the rugby field is versatility. The second-year 8-man is everywhere at once. Senft flies around the field and is just as comfortable crashing into the bigger inside players as she is tracking down speedy wingers on the flanks of the field. “I think that comes with inner aggression. I’m not big and I’m not small so that helps me have the agility to be quick but also to have the power to tackle,” said Senft. Vikes head coach Brittany Waters said that the role Senft plays in the middle of the field is invaluable to the Vikes. “Gabby is a versatile and exciting player. She has a high work rate and steps up to perform every game,” said Waters. That versatility is something that comes from Senft’s diverse athletic background. The product of Regina, Saskatchewan played a little bit of everything growing up, but it was love at first sight when she started rugby at 15 years old. “When I played rugby it was the perfect mixture of all the other sports and I have loved it ever since,” said Senft. After impressing with both the Saskatchewan provincial team and the prestigious Notre Dame high school, Senft had her pick of which university to continue her rugby career at. Luckily for UVic, the phenom from the prairies wanted to study something that has a distinct west coast vibe. “I’m studying Earth and Ocean Sciences and of course I can’t do that in Saskatchewan. I love B.C., so I wanted to be here,” said Senft. Senft’s first year as a Vike couldn’t have gone much better on the field from either a team or a personal perspective. She racked up five tries in six Canada West regular season and playoff games en route to being named the CIS Rookie of the Year. With the honour, Senft was the first Vike to ever win a major CIS award in women’s rugby. “I was shocked, I knew I had a chance to win it but when I saw the girls that I was up against I didn’t expect to win it,” said Senft. The strong year that Senft had was mirrored in her team’s success. Last year was the best in the program’s history. The team went 2-2 in the regular season, a strong but if not spectacular outing, but leading into the playoffs a flip was switched. 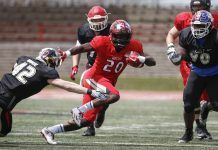 The Vikes reeled off two straight victories to capture the schools first ever Canada West title and then won three games at the CIS National Championship to finish fifth in the nation. “We saw hope as we went into the Canada West tournament. We knew that we could do better than we did in the regular season, and that mental drive helped us push through our pain in the tournament,” said Senft. Those in charge of Canadian women’s rugby have taken note of the power that Senft plays with. 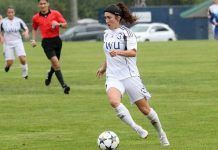 She has gone on four tours with the Canadian women’s development program, including making the trip across the Atlantic Ocean to play in England twice. 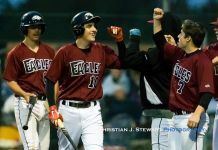 “That has made me a better player on the field as well as giving me experiences that have helped me off of it,” said Senft. As the Vikes prepare to host the CIS National Championship on November 3-6, Senft will be leaned on to be one the best players on the team. While that burden may be too much for other young athletes, Senft has been preparing for her time to shine for a long time. “It’s exciting, it gives me joy to think that all my family and friends can come out and watch me do what I love to do,” said Senft.